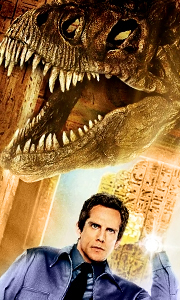 Night At The Museum: In this hilarious comedy-adventure, kindhearted dreamer Larry Daley (Ben Stiller) is hired as the night guard for the Museum of Natural History. But when he discovers that all the exhibits come to life - and wreak total havoc - after the sun sets, Larry turns to President Teddy Roosevelt (Robin Williams) to help control the chaos! Night At The Museum - Battle Of The Smithsonian: History is larger than life - and twi..
Own Night At The Museum / Night At The Museum 2 / Night At The Museum 3 - Secret Of The Tomb DVD from Deff, DVD, Blu-Ray & 4K Video Specialists - Free UK Delivery..
GET READY FOR TWICE THE LAUGHS AND DOUBLE THE FUN... with Night at the Museum and Night at the Museum 2 - together on Blu-ray for the first time ever! The action roars to life as never before with unparalleled high-definition picture quality, the purest digital sound and jaw-dropping special features...it's the greatest entertainment experience in history!Special Features NIGHT AT THE MUSEUM: Commentary By Director, NIGHT AT THE MUSEU..
NIGHT AT THE MUSEUM: Ben Stiller leads an all-star cast including Robin Williams in this hilarious blockbuster hit. When Larry Daley (Stiller) is hired as a museum night watchman he soon discovers that all the exhibits come to life after the sun sets. Suddenly, Larry finds himself face-to-face with a frisky T. Rex skeleton, tiny armies of Romans and cowboys and a mischievous monkey who taunts him to the breaking point. But he may just ..
Larry Daley (Ben Stiller) finds himself in the biggest, most mind-boggling family adventure yet when history comes to life in the local museum. This time the museum is bigger, the adventure is wilder and the bad guys are even more evil...or so they like to think, as an Egyptian Pharaoh plans to take over the world! Leading an all star cast (including Amy Adams, Owen Wilson, Hank Azaria, Steve Coogan, Ricky Gervais and Robin Williams), L..
Larry Daley (Ben Stiller) finds himself in the biggest most mind-boggling family adventure yet when history comes to life in the local museum. This time the museum is bigger, the adventure is wilder and the bad guys are even more evil...or so they like to think, as an Egyptian Pharaoh plans to take over the world! Leading an all star cast (including Amy Adams, Owen Wilson, Hank Azaria, Steve Coogan, Ricky Gervais and Robin Williams), La.. If it’s laughter you’re after, get ready for the most hilarious night ever! Ben Stiller leads an all-star comedy cast, including Robin Williams, Owen Wilson, Rebel Wilson and Ricky Gervais, for one final, fun-filled Night at the Museum. This time, Larry Daley (Stiller) and his heroic friends embark on their greatest adventure yet as they travel to London in order to save the magic that brings the museum exhibits to life!Special Featur..
Ben Stiller leads an all-star cast including Robin Williams in this hilarious blockbuster hit. When Larry Daley (Stiller) is hired as a museum night watchman he soon discovers that all the exhibits come to life after the sun sets. Suddenly, Larry finds himself face-to-face with a frisky T. Rex skeleton, tiny armies of Romans and cowboys and a mischievous monkey who taunts him to the breaking point. But he may just figure out a way to co..